Top seed Pedro Sousa falls to Tallo Griekspoor. 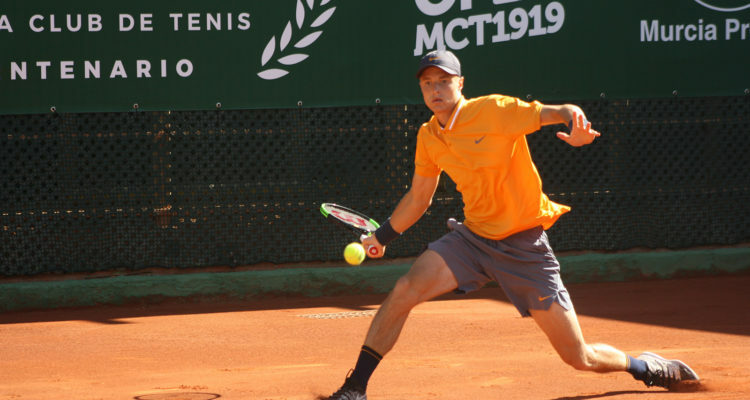 Rudolf Molleker of Germany emerged victorious from the battle of the teenagers with 15-year-old Spaniard Carlos Alcaraz Garfia to reach the quarterfinals of the €46,600 Murcia Open. The 18-year-old won 6-1, 6-7(5), 6-3. Molleker struck eight aces and broke his opponent’s serve four times to prevail after one hour and 50 minutes. The No. 9 seed will next take on Mikael Ymer of Sweden, who defeated ITF-entry Raul Brancaccio of Italy 7-5, 6-3. Tallon Griekspoor from the Netherlands knocked out top seed Pedro Sousa from Portugal, winning 7-5, 7-6(6). The 22-year-old Dutch won 51 per cent of the total points played to secure victory in one hour and 56 minutes. Griekspool will next face No. 6 seeded Italian Salvatore Caruso. Earlier in the day, Kimmer Coppejans fought past the tournament’s No. 4 Lukas Rosol from the Czech Republic 7-5, 2-6, 7-5. The No. 13 seed from Belgium won 66 per cent of his first service points, finishing the match with his sixth ace after two hours and 29 minutes. Next up for Coppejans will be Bernabé Zapata Miralles, who beat fellow Spaniard Mario Vilella Martínez 7-6(1), 6-4 in one hour and 46 minutes. No. 2 seed Roberto Carballés Baena of Spain remained untroubled in his third encounter with compatriot Sergio Gutierrez Ferrol, winning 6-1, 6-4. The World No. 113 outpointed his opponent 60-36 to advance in 64 minutes. Carballés Baena will next play Enrique López-Pérez from Spain. This entry was posted in ATP Challenger Murcia, ATP Challenger Tour and tagged ATP Challenger Tour, Murcia Open, Rudolf Molleker.